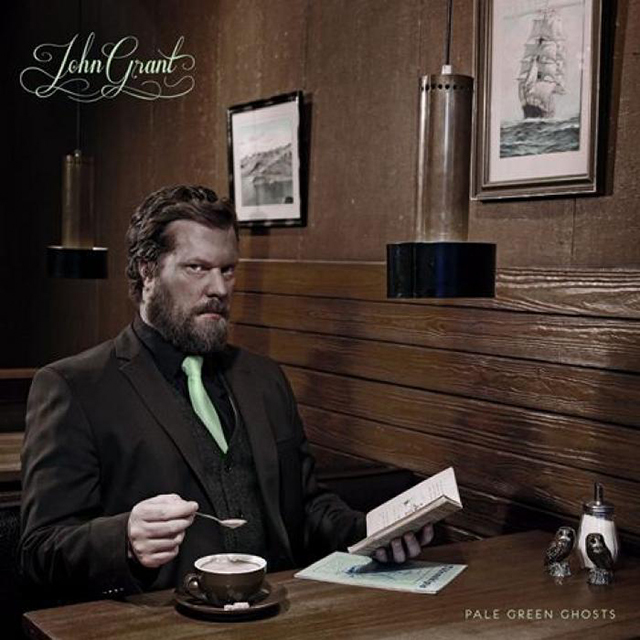 Following the divine Queen of Denmark, topping best album lists back in 2010 John Grant has unleashed his latest offering PALE GREEN GHOSTS, produced Icelandic producer Biggi Veira. Wow, straight up this is a totally different record to the last one (still one of my all time favourites I have to say). With the absence of Midlake's 70's folk-pop behind Grant he has taken on an 80's electro-pop deviation, but it's all Grant and his unique lyrical wit is defiant and well and truly in tact. Opening with the title track it sounds like he's got the Chromatics on backing duties, the hypnotic synth reminiscent of their Tick of the Clock track which featured on the Drive soundtrack and Night Drive LP. Black Belt bounces along to an early 80's synth hook being played in a dirty disco, GMF (feat. Sinéad O'Connor) sees the first of 4 tracks that feature Sinéad O'Connor, it's at this point where Grant comes back to his old self and could easily have been from the last LP. It Doesn’t Matter To Him (feat. Sinéad O'Connor) is Sinéad and John's most effective duet set to strumming acoustic guitars soaring synths. Sensitive New Age Guy is vintage Grant using a synth hook that Yazoo should have written. This is followed by the sublime Ernest Borgnine, that has everything and the kitchen sink thrown in with total precision. I Hate this Town is another Grant happy-sing-a-long with sinister undertones. The Album finishes with the ethereal ballad Glacier, the last to feature Sinéad together with beautiful violins and cascading pianos. Highly Recommended.